Grow your own food right in your yard. Any plot of land will work, let us help show you how. Lots of people are interested in having their own garden at their homes. Who wouldn't be? There is nothing more therapeutic, more fresh, more delicious than walking outside of your door and picking something you grew. Unfortunately, many people struggle with having a high yielding garden and because of that, they get discouraged or don't want to do it anymore, and the garden turns into a weed box. 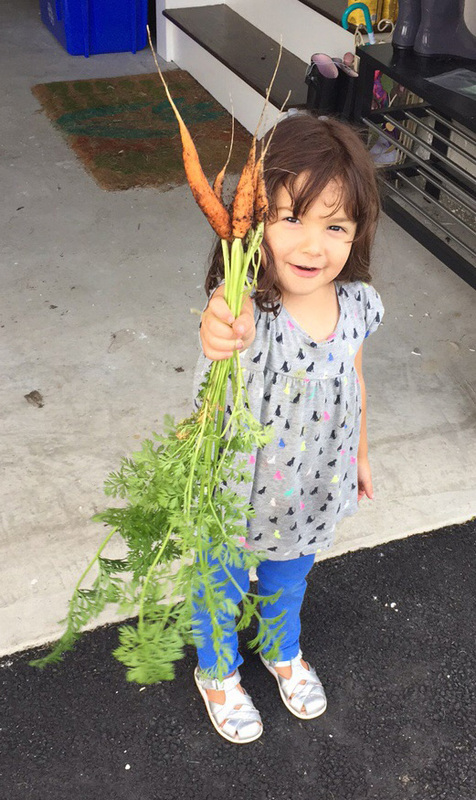 We help take the guess work out of it, giving families the foundation for growing fresh and beautiful produce right at home. We tailor the garden to what you want, whether it's a small flower bed, or two giant raised vegetables beds, for a fair price we set it up, get great compost in there, and start you off with awesome vegetable plugs so early on you can be harvesting and eating the produce. There are countless benefits that come from having a garden space at your home. For me, it's the most relaxing and therapeutic space I know. At the very least it gets me moving, it a space where my self-esteem thrives. All the stresses I feel, all the anxieties tend to go away when I am in my garden. It offers this amazing immeasurable feeling and then on top of it, it gives back to you in terms of food and nutrition. I believe it helps to simplify the world because it is a slow, patient game, that requires you to be relaxed. I want everyone to have this feeling. Even if it's just an herb and flower garden, or it's a seasonal vegetable spot, it can provide so much for you and your family. Again, this all depends on what you want to grow. If you only want leafy greens, yields will look lower, but if you have a lot of diversity including tomatoes, squash, cabbages, poundage can look a little different. I will teach you many great gardening techniques that will maximize whatever space you have!